Beyond civilization, in the farthest reaches of the galaxy, there are places where few sentients have ever trodden the ground. Places like these are ideal hiding spots for those fleeing the law or retribution for their actions. Places like these are where Survivalists thrive. 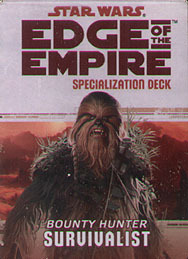 This deck requires the Edge of the Empire Core Rulebook and includes cards for all 20 talents available in the Survivalist specialization.